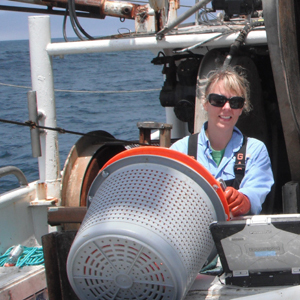 Susan Hilber Piacenza, an Oregon State University PhD candidate, has been awarded a prestigious National Marine Fisheries Service fellowship to study population dynamics of threatened and endangered sea turtles. So far, signs of positive population growth among C. mydas colonies in Hawaii and Florida has been inferred from nesting beach surveys. What’s missing – and what Piacenza plans to study – is broader data on what happens to the animals after they hatch, and throughout their lives, and how that information fits into population estimates and trends. The research could be useful to biologists and managers seeking to understand how populations of other threatened and endangered animals change over time, and as a population comes back from the brink. Solid, data-driven forecasting could also help scientists and the public understand how different conservation and management strategies might affect threatened animal populations. Piacenza is working with researchers at the Southeast Fisheries Science Center Turtle Program in Miami, FL, and the Pacific Island Fisheries’ Marine Turtle Research Group in Honolulu, HI. Her PhD adviser in the OSU Department of Fisheries and Wildlife is Dr. Selina Heppell. The award is one of five population dynamics fellowships nationwide by NOAA/NMFS this year, and the first ever to an OSU graduate student. Piacenza’s application was sponsored by Oregon Sea Grant. Marine fossils and sea turtles take center stage in February and March as OSU’s Hatfield Marine Science Visitor Center presents two special learning and exploration events for the whole family. On Saturday, Feb. 9 at 11:30 a.m., join us for FossilFest, one of our most popular winter events and a chance to learn about the fascinating fossils you can find on the Oregon coast. Bring your own specimens for expert identification or to swap with other fossil enthusiasts, or pick up a free fossil from our sample table and start a new hobby. Guest speakers include Dr. William Orr of the University of Oregon and Guy “the Oregon Fossil Guy” DiTorrice of Newport. Children’s activities, presented by the North America Research Group (NARG) include digging for shark teeth, making a shark tooth necklace, painting a fossil replica, and an ammonite toss. On Saturday, March 1, come learn about the fascinating world of sea turtles as the Visitor Center hosts Sea Turtle Saturday, starting at 11:30 a.m. Speakers include Dr. Larry McKenna, author of “Almost Gone,” the story of the endangered leatherback sea turtle, and Dr. Selena Heppell, an OSU marine biologist who will talk about successful turtle conservation efforts around the world. Kids can take part in a Leatherback Painting Contest where everone goes home a winner! The Visitor Center is located on Yaquina Bay in Newport, just south of the Yaquina Bay Bridge. Admission is by donation.